Our schools have vacillated between adulating and dismissing imagination; neither attitude suffices. Imagination involves forming things in the mind; education cannot do without it. Yet to employ it well, one must understand it correctly and combine it with actual learning. In his bracing book Why Knowledge Matters: Rescuing our Children from Failed Educational Theories, E. D. Hirsch Jr. explores the origins and consequences of our schools’ emphasis on “natural” creativity and imagination at the expense of concrete learning. He points to the destructive effects of this trend, both in the United States and in France (which moved from a common curriculum to a child-centered mode of instruction). In addition, he offers wise commentary on standardized tests, the teaching profession, and the Common Core initiative. An admirer of Hirsch’s work and of Core Knowledge schools, I object to just one aspect of his argument: By opposing creativity and imagination to specific training and instruction, he limits both. Recognizing this possible pitfall, he acknowledges that a school with a strong curriculum can still encourage imagination—but he does not treat the latter as vital and endangered. Imagination, in his view, has been overemphasized; the necessary corrective lies in specific, sequenced instruction. What is imagination? It is not the same as total freedom of thought; it has strictures and structures. To imagine something is to form an image of it. Every subject requires imagination: To understand mathematics, you must be able to form the abstract principles in your mind and carry them in different directions; to understand a poem, you must perceive patterns, cadences, allusions, and subtleties. To interpret a work of literature, you must notice something essential about it (on your own, without any overt highlighting by the author or editor); to interpret a historical event, you may transport yourself temporarily to its setting. Civic life, too, relies on imagination; to participate in dialogue, you must perceive possibility in others; to make informed decisions, you must not only know their history but anticipate their possible consequences. Imagination forms the private counterpart of public life; to participate in the world, you must be able to step back and think on your own, as David Bromwich argues in his essay “Lincoln and Whitman as Representative Americans” (and elsewhere). Plato’s Allegory of the Cave describes the cultivation of the imagination. The uneducated mind, the prisoner in the cave, accepts the appearances of things (as manipulated by others); once embarked upon education, it slowly, painfully moves toward vision of true form. People are quick to dismiss Plato’s idealism as obsolete—but say what you will, it contains the idea of educating oneself into imagination, which could inform many a policy and school. Schools and school systems have grievously misconstrued imagination; drawing on Romantic tendencies, as Hirsch explains, they have regarded it as “natural” and therefore good from the start. If imagination is best when unhampered and untouched, if it is indeed a process of nature, then, according to these schools, children should be encouraged to write about whatever pleases them, to read books of their own choice, and to create wonderful art (wonderful because it is theirs). Some years ago I taught at a school where we were told not to write on students’ work but instead to affix a post-it with two compliments and two suggestions–so as not to interfere with the students’ own voice. This is silly, of course. Serious imaginative work—in music, mathematics, engineering, architecture, and elsewhere—requires knowledge, discipline, self-criticism, and guidance from others. You do not learn to play piano if your teacher keeps telling you, “Brilliant, Brilliant!” (or even, in growth-mindset parlance, “How hard you worked on that!”). To accomplish something significant, you need to know what you are doing; to know, you must learn. Mindset aside, you must be immersed in the material and striving for understanding and fluency. You must listen closely; you must acknowledge and correct errors. Learning draws on imagination and vice versa; a strong curriculum is inherently imaginative if taught and studied properly. Students learn concrete things so that they can think about them, carry them in the mind, assemble them in interesting ways, and create new things from them. On their own, in class, and in faculty meetings, teachers probe and interpret the material they present. This intellectual life has both inherent and practical value; the student not only comes to see the possibilities of each subject but lives out such possibilities in the world. Hirsch objects, commendably, to the trivialization of curriculum and imagination alike: for instance, the reduction of literature instruction to “balanced literacy” (where students practice reading strategies on an array of books that vary widely in quality). Conducted in the name of student interest, creativity, initiative, and so forth, such programs can end up glorifying a void. Without strong curricula, creative and imaginative initiatives will lack meaning, especially for disadvantaged students who rely on school for fundamentals. You cannot learn subjects incidentally; while you may gain insights from a creative algebra project, it cannot replace a well-planned algebra course. But imagination belongs at the forefront of education, not on the edges; it allows us to live and work for something more than surface appearance, hits, ratings, reactive tweets, and prefabricated success. Imagination reminds us that there is more to a person, subject, or problem than may appear at first. It enables public, social, private, economic, intellectual, and artistic life. Without it, we fall prey to shallow judgment (our own and others’); within it, we have room to learn and form. Photo credit: I took this picture yesterday in Poets’ Walk Park in Red Hook, NY. After yesterday’s discussion of springs and sine graphs, I remembered a post from 2012, “Daydreams, Lectures, and Helices.” I decided to figure out how to graph a helix in R.
Well, after installing the rgl package and experimenting a bit, I got it to work. I then rotated it into a good view. As my Latin teacher used to say, that’s all there is to it! Next up (at some point): an animation of a spring. Elizabeth Green’s recent article and book excerpt “Why Do Americans Stink at Math?” has drawn keen responses from Dan Willingham, Robert Pondiscio, and others.Still, one problem needs more emphasis: the lack of focus in the classroom. Math, like most other subjects, requires not only knowledge, but concentrated and flexible thinking, on the part of teachers and students alike. With this in place, a number of pedagogical approaches may work well; without it, pedagogy after pedagogy will flail. The ongoing discussion has upheld a false opposition between old “rote” methods and (supposedly) new methods devoted to “understanding.” It is time to see beyond this opposition. By “focus,” I mean concerted attention to the topic at hand. This is not the same as perfect behavior; I have known some “wiggly” students who were clearly thinking about the lesson. Nor does it mean passive intake; to the contrary, it can involve a great deal of questioning, comparison, imagination, and so forth. Such focus is largely internal; in this way it differs from what people commonly call “engagement.” A student may be highly focused while doing nothing physically; a student may be visibly active (in lesson activities) but not thinking in depth about the subject. Most American math classes follow … a ritualistic series of steps so ingrained that one researcher termed it a cultural script. Some teachers call the pattern “I, We, You.” After checking homework, teachers announce the day’s topic, demonstrating a new procedure: “Today, I’m going to show you how to divide a three-digit number by a two-digit number” (I). Then they lead the class in trying out a sample problem: “Let’s try out the steps for 242 ÷ 16” (We). Finally they let students work through similar problems on their own, usually by silently making their way through a work sheet: “Keep your eyes on your own paper!” (You). The “elephant in the room” is our devotion to damage control in the name of something lofty. We are trying to repair situations where students are not doing all they can to master the material. Likewise, we are shaping the teaching profession to be more managerial, athletic, and social than intellectual. There’s a lot of mention of “collaboration”–but nothing about thinking about the subject on one’s own. If students in a classroom are all putting their mind to the topic at hand (not because the teacher has “engaged” them but because this is what they do as a matter of course), and if the teacher knows the topic thoroughly and has considered it from many angles, then the learning will come easily–if there is a good curriculum, and if the students have the requisite background knowledge. That sounds like a lot of “ifs,”–but it comes down to something simple: when you enter the classroom, you have to be willing to set distractions aside and honor the subject matter. Honoring it does not mean treating it as dogma. It means being willing to make sense of it, ask questions about it, and carry it in your mind even when class is over. If the above conditions are absent, then that is the problem, period. It is not a question of who is doing the talking, or how well or poorly the teachers have been trained. Suppose I am a math teacher. (I am not and never have been; I currently teach philosophy.) Suppose I am teaching students to solve a problem of the following kind: “A train travels an average of 90 miles per hour for the first half of its journey, and an average of 100 miles per hour for the entire trip. What was the train’s average speed for the second half of the journey?” First I must establish that by “half” I mean half of the distance traveled. Then I must start to anticipate errors and misunderstandings. (Someone will likely offer the answer “10 miles”; another might offer “110 miles.”) I must be able to get other students to explain why these are not correct. Then how to proceed? I ask the students what information we have, and what we are trying to find out. We know that the journey consists of two equal parts. It doesn’t matter how long each one is, since we are looking at speed, not distance traveled. So, we will call it d, but we are not going to try to find out what d is. It does not matter here. Let t1 designate the time taken (in hours) by the first half of the trip; t2, the time taken by the second half, and t the total time. So, we know that d/t1 = 90 mph for the first half. Thus, t1= d/90. We don’t know what d/t2 is for the second half, since we don’t know the train’s speed, or rate (r) for the second half. Thus, t2 = d/r. We know that 2d/t (total distance divided by total time) = 100 mph. Thus, t = 2d/100. We know that t = t1 + t2. Thus, 2d/100 = (d/90 + d/r). Thus, 1/50 = 1/90 + 1/r. Thus, 1/r = 1/50 – 1/90. Thus, r = 450/4 = 112.5 mph. As I lay this out, I can see some of the misconceptions and confusion that might arise. Some students might remain convinced that we need to find out what d is. Some might assume that t1 and t2 are equal. Some might grasp the steps but not know how to go about doing this themselves. Some might not know how to check the answer at the end. But if I go to class prepared to address these issues, and if the students continually ask themselves (internally) what they understand and what they don’t, then even this amateur lesson will get somewhere–unless the levels in the class are so disparate that some students don’t know what an equal sign is. Of course, doing this day after day is another matter; a teacher needs extensive practice in the subject matter in order to prepare lessons fluently. But if we ignore students’ obligation to put their mind to the lesson (in class and outside), teachers’ obligation to think it through thoroughly, and schools’ obligation to honor and support such thinking, we will continue with confused jargon and hapless reforms. Moreover, classrooms that do have such qualities will be dismissed as irrelevant exceptions. Note: I made a few revisions to this piece after posting it. 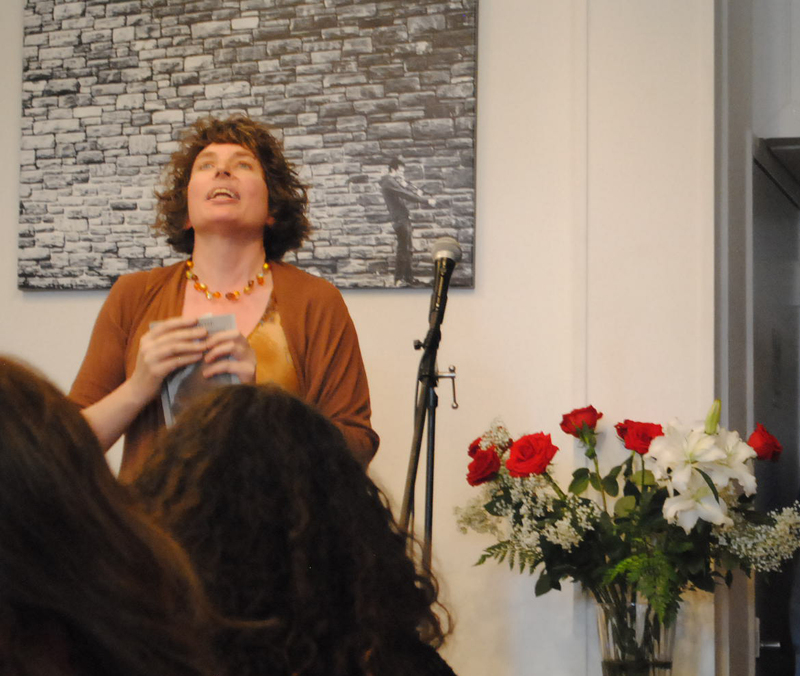 Update 8/23/2014: In response to a reader’s comment, I changed “elementary school teacher Magdalene Lampert” to “elementary school teacher and scholar Magdalene Lampert.” It was not my intention to understate her academic credentials–or to comment on her work. 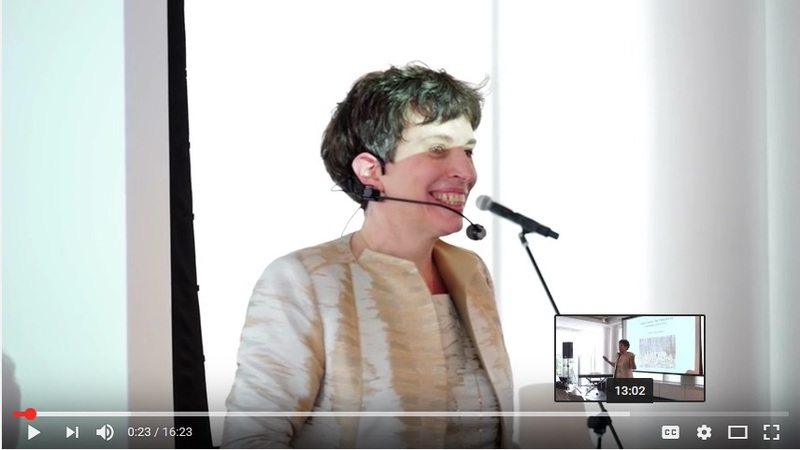 What Is Joy, and What Is Joy in Learning? This morning I read a piece by Annie Murphy Paul titled “Fostering Joy, at School and at Work.” She begins by describing the efforts of Menlo Innovations to create a joyous workplace (a great success, according to the CEO). Unsatisfied with the unscientific nature of this report, Paul then turns to research by the Finnish educators Taina Rantala and Kaarina Määttä on the subject of joy in schools. They conclude that (a) “teacher-centric” instruction does not foster joy (in their words, “the joy of learning does not include listening to prolonged speeches”), whereas student-centered instruction does; (b) students are more joyous when allowed to work at their own pace and make certain choices about how they learn; (c) play is a source of joy; and (d) so are collaboration and sharing. Before taking apart these findings (which hold some truth but are highly problematic), let us consider what joy is. Joy is not the same as cheer, happiness, or even enjoyment. It does not always manifest itself in smiles and laughter. It is a happiness that goes beyond regular happiness; it has to do with a quality of perception—of seeing and being seen, of hearing and being heard. When you suddenly see the solution to a geometry problem, you are also seen, in a way, because your mind has come forward in a way that was not possible before. When you listen to a piece of music that moves you, it is as though the music heard you as well. Joy has a kind of limitlessness (as in “Zarathustra’s Roundelay” in Nietzsche’s Thus Spoke Zarathustra) and stricture (as in Marianne Moore’s poem “What Are Years?”). One thing is clear about joy: when it comes, it marks our lives. It is not to be dismissed. So, let us look at the first of the research conclusions cited by Paul: that “teacher-centric” learning does not foster joy. My personal experience contradicts this flat out: some of my greatest joy in school (K-12, college, and grad school) happened when I was listening to a teacher or professor who had insights into the subject. The listening was not passive; to the contrary, it woke up my mind. Likewise, as a teacher, I have known those moments when students are listening raptly—not necessarily because of something I have done, but because the subject itself is so interesting. Of course, students need a chance to engage in dialogue as well. I am not advocating for one-way discussion. Nor do I consider a lecture necessarily “teacher-centric”; it may be the most “student-centered” thing the students have encountered all day, in that it gives them something interesting to think about. Or maybe it is subject-centered. Whatever it is, there is no need to rush to put it down. Take a closer look at it first. Consider the great freedom of listening–and the great gift of something to listen to. Working at one’s own pace—yes, there may be joy in finding one’s own velocity and rhythm. But in the higher grades, this normally takes the form of homework. In the classroom, one is discussing the material; such discussion can meet several levels at once. In a discussion of a literary work, for instance, some students may be puzzling through it for the first time, whereas others may be rereading it and noticing new things. The class comes together in discussion—but outside of class the students may indeed work at their own speed and in their own manner (while also completing assignments on time). As for play, it too can be well or ill conceived. There is play that leads to amusement, and play that leads to joy. (Amusement is not a bad thing, but it is not joy.) Also, play does not always bear the obvious marks of a game, although it can. There is play in considering an untried possibility or taking an argument to its logical conclusion. There is play in questioning someone’s assumptions or taking apart an overused phrase. My students’ philosophy journal, CONTRARIWISE, is full of play of different kinds—and it’s also intellectually serious. An academic essay can be filled with play in that the author turns the subject this way and that. If you are immersed in a subject, you end up playing with it. Thus, when there is no play in a classroom, something is wrong, and joy is probably absent—but this doesn’t mean that students should be playing “algebra badminton” (whatever that is—I just made that up) every day. As for the researchers’ last point—about collaboration and sharing—yes, those can be rewarding. But did the researchers consider how much joy can also come from working alone, or, even better, from a combination of solitude and collaboration? As long as I can remember, I have loved to sing with others, but I don’t think that would have had meaning if I didn’t also sing alone, in private. It is there that one comes to know the song. If you have ever gone out into the woods to sing—or even sang quietly while walking to the subway—then you know what it is like. It seems sometimes that the song must be solitary in order to exist at all. I am only touching on this subject, which I have discussed at length elsewhere; in any case, sharing and collaboration are only a part of joy. Note: I made a few minor edits after the initial posting; on February 6, 2017, I made a few more. Lanham, MD—Last Saturday, nearly all of the teachers at Fernwood High school bustled around the building making photocopies, preparing lessons, or interviewing prospective teachers. One applicant’s résumé quickly became the subject of gossip and tweets. “Not a team player,” read the first item in the “Skills” section of Rebecca Seule’s résumé. The principal, Ariane Waarom, suspected there was more to the story. “No one would just do that on a lark,” she insisted. “She must have some unusual purpose.” She decided to give Seule a call, just to find out what she had in mind. “At the very least, it’ll prepare us against future onslaughts,” she told herself. When asked why she had put such unreasonable words on her résumé, Ms. Seule had a lot to say. “Well, I think that counts as teamwork,” Principal Waarom ventured. “How would that not be the whole?” queried Waarom, intrigued. “Wouldn’t you want to share your findings with the team?” pressed Waarom. Panic set in across the district. They needed to call themselves something, soon. What would it be, if not a team? Now the challenge lay in finding résumés with “Success Hub Facilitator” in the “Skills” section. The task proved trivial; within fifteen minutes, they were streaming in. Note: I made minor edits to this piece long after posting it. What do daydreams, lectures, and helices have to do with each other? Quite a bit. aaamy eyes, transforming thought on thought to dream. I read this as a tribute to daydreaming (though Dante is on the verge of sleep and a nightmare). To be “so drawn from random thought / to thought” (in the original: “e tanto d’uno in altro vaneggiai”) is to have an expanse and few restrictions; I love this kind of expanse, though of course I can’t have it all the time. As I have said elsewhere, that is one thing I enjoy about lectures: they not only take my mind to unexpected places, but they send it wandering off to the side and back, or backwards and forwards. While listening to a lecture, I may do with my mind what I please; if the lecture is good, then my mind dances with it, sometimes spinning away, sometimes drawing close. If the lecture is bad (or dreadfully dull, as lectures sometimes can be), then my mind can go off on its own. This, too, has its benefits. Adding the component t k turns the circle into an upward spiral. A dull lecture is like an experiment in sensory deprivation. You are sitting in your seat, you can’t leave the room because that would be too rude, you are carefully shutting out the incoming information because you have decided you don’t want to hear it, and your mind is now completely free from external disturbances. It was during this lecture that I suddenly saw how all the facts of the case would fall together. Yes, during this dull lecture he figured out why a sound entering the cochlea produces a “microphonic potential”–an electric potential that both amplifies the sound and mimics its waveform. He took his theory to Richard Pumphrey, with whom he had been investigating this matter; they published their papers in 1948. But that’s an aside here (though interesting in itself). I bring this up because his words about the lecture rang true, so to speak, in my mind. Then, a few pages later, I came upon his description of an experiment with a helix and an eel. The eel can move forward along a sinusoidal curve, both horizontally and vertically. Thomas Gold and the zoologist Sir James Gray found that it could move swiftly and easily through a sinusoidal tube. Sir James Gray posited that the eel could therefore move through a helical tube; a helix, after all, is the addition of the vertical sinusoid to the horizontal sinusoid in three-dimensional space. Thomas Gold disagreed; he was convinced that the eel could not move through the helical tube. He was right. equivalent to the addition of two traveling sinusoidal waves, one horizontal, one vertical, in three-dimensional space? I grasped that it was but spent a little time explaining it to myself. Yes, and the two sinusoids must be a quarter-cycle out of phase with each other. The first traveling sinusoidal wave has the equation r(t) = cos t i + t/2 k.
The second traveling sinusoidal wave has the equation r(t) = sin t j + t/2 k.
So, unless I’m missing something, these sinusoids are twice as scrunched as the resultant helix, their sum. These have been my daydreams, or a fraction of them, over the past week or so. There were no lectures involved, but there were memories of lectures and the liberty I found in them. Note: I corrected one term and made a minor revision after the initial posting. Since the summer, I have been obsessed with the problem of squaring the circle—that is, finding the square whose area is equal to that of a given circle, with no tools other than a straight edge and compass. I, too, had difficulty reaching the principle—and it was precisely the principle that I needed to find. The difficulty lies in determining what the problem exactly is. No one has found a way to square the circle with compass and straight edge alone; in fact, I believe it has been proved that it can’t be done. Yet I kept on trying, thinking that I would learn something from the attempt. Yesterday morning, something close to a solution came to me—not a solution, mind you, but something that points in the direction of one. It’s probably old hat—or ancient hat—but it’s interesting, all the same. We will consider the circle with radius r=1, since expanding or shrinking it (and the square) is then a trivial matter. We know that if the circle has radius 1, its area is π. Thus, for a square to have that area, it must have sides of length √π. But how do you find length √π? There’s the puzzle. When the square and circle have the same area, the ratio of the circle’s circumference to the square’s perimeter is a constant, 2π divided by 4√π ; that is, π/2 divided by √π; that is, √π/2. In other words, the ratio of one-quarter of the circle’s circumference t0 one side of the square will always be √π/2 when the square and circle have the same area. Now, the ratio of |OP| to |AO| is equal to the ratio of|BC| to |AB|, where |BC| = √π = |AO|, and |AB| = 2. We already established this ratio a few paragraphs up. So now the challenge is to tweak the figure until |AO|=|BC| (while keeping points A, P, and C on a single line and A, O, and B on a single line). When we get the two segments to equal length (without changing |OP| or |AB|), we have brought both |AO| and |BC| to √π. Now, you must do this by trial and error, by shifting the OP segment. 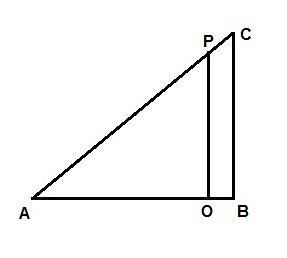 If |BC| is greater than |AO|, then move OP closer to BC; if it is smaller than |AO|, then move OP closer to A. Your adjustments will be smaller and smaller until you either make |AO| and |BC| equal or come as close as you wish. The next step would be to find a mathematical way of doing this. Once you have made |AO| and |BC| as close to equal as you wish, you then make AO the side of your square, which you superimpose on a circle of radius 1 (so that both have a common center). 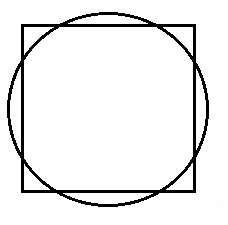 You will see that the square is mostly, but not entirely, contained within the circle. It will look like the first of the two figures above. Although this is not a satisfactory solution, it results in a close approximation and seems to be on the right track. Update (on a tangent, so to speak): The angle in the figure is the inverse tangent of √π/2, or 41.54822621257918513… Its common logarithm (1.6185524875…) is tantalizingly close to the golden ratio, but not close enough for the trumpets to sound. Note: This is a reposting of a piece that originally appeared on October 19.